Four years ago, as voters were about to cast the first ballots in the 2008 election, the public’s mood was not very good, but still a lot better than it is today. In late 2007, the economic recession was gaining strength and the public’s view of the economy had grown more negative. Only about a quarter (27%) were satisfied with national conditions, not much higher than the current measure of 17%. In some ways, however, the economic picture looked much brighter. Roughly four-in-ten (41%) said jobs were plentiful in their local community, nearly three times the number from earlier this year (14%). The unemployment rate was 5%, an enviable figure in today’s climate. Still, the public sensed that the economy was about to take a turn for the worse. In January 2008, 26% said, presciently as it turned out, that the economy would be worse in a year, compared with 20% who said the economy would be better. In a Pew Research Center survey released last week, more said the economy will be better than worse a year from today (28% vs. 18%). Four years ago, George Bush’s presidency was beginning its final lap. In December 2007, just 31% approved of the way he was handling his job as president; Bush’s approval rating was to sink even lower over the course of the next year, hitting an all-time low of 22% in October 2008. While Barack Obama has lost a large measure of public support over the past three years, his current job rating stands at 46%. The wars in Iraq and Afghanistan were still major public concerns. 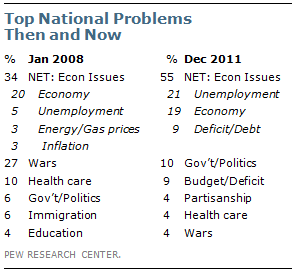 In January 2008, 34% cited the economy as the top national problem, while 27% cited the two wars. Today, as the last U.S. troops leave Iraq and thousands of troops remain in Afghanistan, only 4% mention these conflicts as top national problems, while 55% cite the economy. 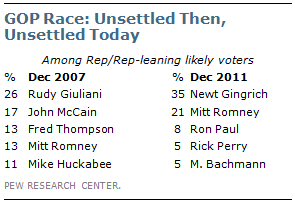 In November 2007, Rudy Giuliani sat atop the national polls. But Pew Research’s survey of three early primary states found that Giuliani led in none – an ominous sign for the former New York City mayor. He later dropped out of the race without a single primary victory. In recent polls, Newt Gingrich has been the GOP frontrunner – the fifth Republican candidate to hold that designation this year. But likely Republican primary voters have not ruled out voting for Mitt Romney and support for both Gingrich and Romney is fairly soft – raising the possibility of more turns ahead. In late 2007, Republican voters were less engaged with the GOP presidential race than they are today. But they expressed a more positive view of the Republican field. Currently, 52% of Republican and Republican-leaning registered voters say they are giving a lot of thought to the candidates, up from 42% four years ago. Four years ago, 56% of Republican voters viewed the presidential field as excellent or good, well below the rating Democrats gave their presidential candidates (67% excellent or good). However, just 48% of GOP voters express positive views of the current field. In 2007, the Democrats were gaining ground in party identification. Based on yearly averages, they held a seven-point advantage over the GOP (35% to 28%), which would increase in 2008 and 2009. Since then the Democrats have lost ground. The percent affiliated with the GOP is comparable to 2007. The number of independents continues to be at or near record levels. A positive sign for the Republicans is that they have cut into the Democrats’ advantage in “leaned” party identification. This year, 47% say they identify with the Democratic Party or lean Democratic while 44% identify or lean to the GOP. In 2007, the Democrats held an 11-point lead in leaned party identification. As in late 2007, the parties share power in Washington. In 2007, the Democrats held majorities in both the House and Senate. Today, Congress itself is divided – the GOP gained control of the House last fall while the Democrats held the Senate, with a narrower majority. The public’s trust in government rose dramatically following the terror attacks of Sept. 11, 2001. But it declined during the remainder of the Bush presidency, following the war in Iraq, the flawed government response to Hurricane Katrina and other events. 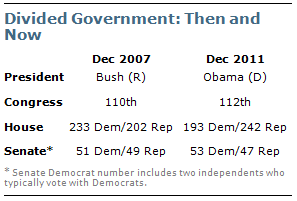 By 2007, just 31% said they could trust the government in Washington to do the right thing always or most of the time. The public’s trust in government has declined even further during Obama’s presidency. In October of this year, just 20% said they could trust the government always or most of the time. 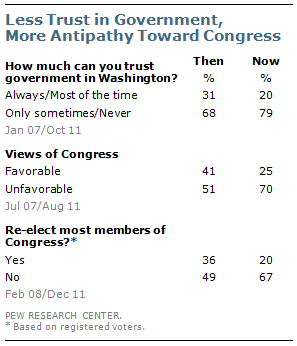 And while views of Congress typically are more negative than positive, there is now record discontent with Congress. Just 20% say they would like to see most members of Congress reelected – 16 points lower than in early 2008 and the lowest percentage ever in a Pew Research Center survey. 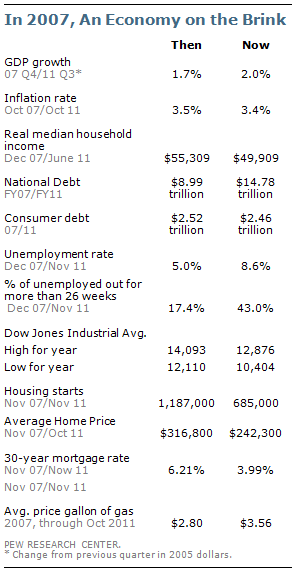 The hard economic data from late 2007 provided a preview of the hard times that were coming. The fourth quarter growth in GDP, while positive, was a paltry 1.7%. GDP growth would turn negative the following year, declining by 8.9% in the fourth quarter of 2008. The growth rate for the third quarter of this year was hardly robust (2.0%), but much better. The nation’s debt has grown more than 60% since fiscal year 2007 – from nearly $9 trillion to close to $15 trillion today. The unemployment rate, while a bit lower than earlier this year, is nearly four percentage points higher than it was in December 2007. There has been a dramatic rise in the number of people facing long-term unemployment. Fully 43% of the unemployed have been out of work for more than 26 weeks; in December 2007, just 17.4% of the unemployed had been out of work that long. The Pew Research Center’s Social and Demographic Trends project has found that long-term unemployment not only takes a severe financial toll, but also can strain personal relationships and erode self-confidence. The economic downturn has been devastating for many homeowners. The average home price is substantially lower than it was four years ago. Yet these are better times for home buyers: the interest rate for 30-year mortgages is more than two percentage points lower than in late 2007, before the housing crash.